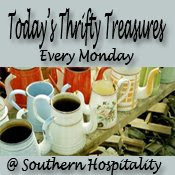 Serenity Now: Thrifty Treasures at "Salbayshun Army"
If you enjoy finding treasures at a bargain, you will love Rhoda's party over at Southern Hospitality. I've seen a little video over at my bloggy friend Susie's spot, and you can be sure that she, Rhoda, and Layla found some great stuff over the weekend at The Longest Yard Sale. I'd love to go to The Longest Yard Sale, but my girls can barely handle two yard sales, much less hundreds of miles of yard sales. Since I couldn't go to The Longest Yard Sale, I decided to venture out with Natalie (3) and Michaela Byrd (19 m) on Saturday morning. T had to be at work, and nothing was open yet (not even the pool! ), so what better way to pass an hour or so with two bored bebes? The yard sales were bust, but Natalie managed to snag a Barbie (I think it's supposed to be one of Barbie's little sisters...she's smaller than a Skipper) for twenty-five cents. Andrea, as she is now called, has two mismatched shoes, but Natalie finds that eclectic fashion sense charming. Natalie actually asked me if we could hit "Salbayshun Army" to look for a new movie. I'm always up for a trip to "Salbayshun Army," and it doesn't hurt that it's just a few miles from home. We picked up an Arthur movie and an old copy of Cinderella, starring Ginger Rogers, both on VHS. $1.00 for both. How about you? Find any good bargains this weekend? Please don't forget about my Decorating Dilemmas party this Wednesday! I will most likely have the link up on Tuesday night around 10pm ET. 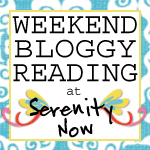 To get the details on my first blog party, please read here. It's basically going to be a spot where you can link up any kind of project you'd like some input on (home interior, exterior, organization, crafty stuff, before and afters, your solutions to dilemmas, etc.). If everyone has a good time, I might just do this once a month. I have enough "dilemmas" around here to last for quite a few posts! It's so nice to have ideas and feedback from bloggy friends, isn't it? I'd love to have you join the party, and remember there will be a prize/Giveaway for participants! This is a great opportunity for anyone out there to link up their posts with projects they'd like feedback on, or share a solution they've found for their decorating issues. Grab my party "button" here or on the sidebar (I know it's not a real button...made it myself, and I am not a techie!!!). For details, you can click the "party" link above. Oh, I've never seen a little urn like that! How sweet, and I bet it will look lovely decorated for fall! That urn is wonderful! Love your blog!!! Love your Salbayshun army stuffs!!! So, so cute! Good deals. I especially like the urn. Love that mixing bowl and I found a silver tray too this weekend for the same chalkboard paint treatment! 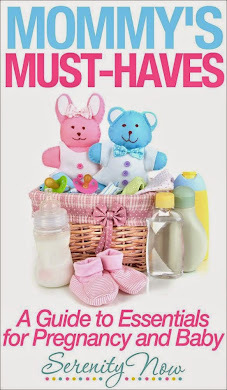 Garage sales with babies - you are brave ! Sometimes I like thrifting better - a little more expensive but - so easy ! I love what you did find and sounds like your little girl did too ! Great finds! That platter will look great as a chalkboard! Thanks for dropping by earlier! I will be back on Wednesday to plead for help on several decorating dilemmas! Super blog! Hey Amanda! Great finds and I love the silver tray. It has a great shape to it. What a wonderful party idea. I can always use a little input! I'm back! Love your treasures...Arthur's my favorite! I can't wait for your DD party! You had me at urn! I also think the silver tray will make a nice chalkboard! Stopping over from Rhoda's and it's my first visit. LOVE me some Seinfeld! Yada yada yada I'm sure I will be back! I LOVE that Natalie even knows what Salbayshun Army is! You are training that girl right! Great finds. the bowl looks like a good size for coffee punch! *Use a very large bowl! Boil to dissolve then set aside in refrigerator. Mix all ingredients in a very large bowl with a hand mixer until smooth. Put a dap of cool whip and cinnamon on top and serve with a ladle. Oh! it's so cute how your daughter pronounces the Salvation army. Great idea for getting movies for the kids. Great mixing bowl. I love the little tray and great party idea by the way. I just started a new party at my blog today. Love the big bowl! We always used them when I was younger, preparing fresh fruit & veggies for preserving.